Joining thousands of travelers on spring break to Orlando, Florida, I navigated through the crowds to meet my conference hostess and page at the baggage claim area. From there I was whisked to a hotel near Disney World for the Florida state conference, Dawn Lemongello, State Regent. It was definitely sandals weather and easy to understand why so many choose this state for retirement and vacations. Florida’s 117th State Conference was held March 21-24 in Orlando at the Florida Hotel and Conference Center. Festivities began with the Tamassee 100th Birthday Dessert Extravaganza with Lori Bailey, Director of Tamassee, speaking while Florida Daughters enjoyed chocolate fondue and coffee. After Lori’s informative talk, there was Country Western line dancing, complete with an instructor and a lot of laughs. Visiting Reporter General Connie Olde and State Regents Alice Ridgway, CT, Jeannine Dobbins, CO, Kathryn West, KS, Cynthia McNamara, MS, and Faye Leach, MN, kicked up their heels and danced with the Florida Daughters. 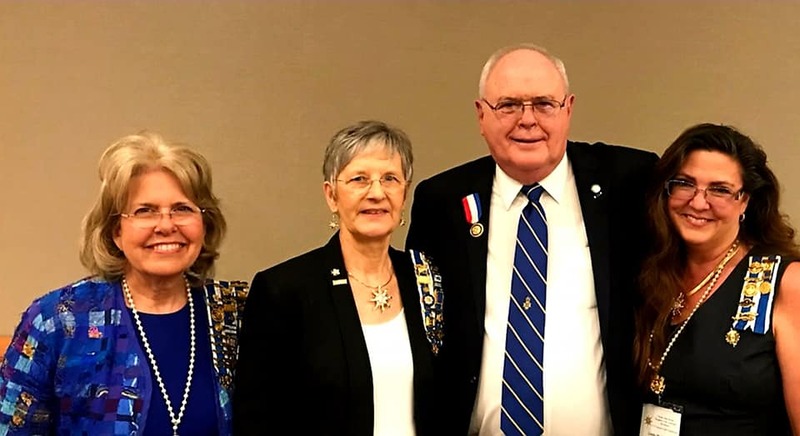 It set a fantastic tone of laughter and fellowship as the members were able to intermingle with visitors and meet members from other chapters. While chapter regents, state officers and honoraries attended a Board of Management meeting on Friday morning, members and guests had a choice of workshops including New Members, Bylaws, and Registrars, as well as “What Chapters Should Keep” given by Reporter General Connie Olde. The National Defense luncheon featured Brig Gen USA (Ret) T. Patt Maney, a retired circuit court judge, who spoke on “Out of Tough Times Come Good Things” a riveting talk on the before and after his jeep hit an IED in Afghanistan. He received the DAR Medal of Honor, having started a Veteran’s Court in FL, nominated by Choctawhatchee Bay Chapter. Not only were the Florida Daughters and guests awed by his humility and humor, but they gave his wife, FSSDAR member Caroline Maney, a standing ovation. Friday evening was Chapter Regent’s Night and once again, the Florida Daughters cheered as Colorado State Regent Jeannine Dobbins piped in the 106 Chapter Regents. Certificates of Appreciation were handed out to all Chapter Regents and the night culminated with Reporter General Connie Olde speaking on “DAR Past, Present and Moving Forward”. The Saturday Junior Membership Luncheon, “The Woman Behind the Junior”, highlighted the various occupations and lives of our Junior members, opening the eyes as to what our younger members do when not in DAR. Saturday afternoon workshops included two DNA workshops, a Chapter Regent Workshop entitled, “Everything I need to Know about Being Chapter Regent I learned from a Nancy Drew Mystery” and “Giving to NSDAR” by Rachael Lipsetts of NSDAR Development. President General Dillon had a front row seat to the Chapter Regent Workshop and could be seen laughing with the rest of us during the funny, but informative skit. 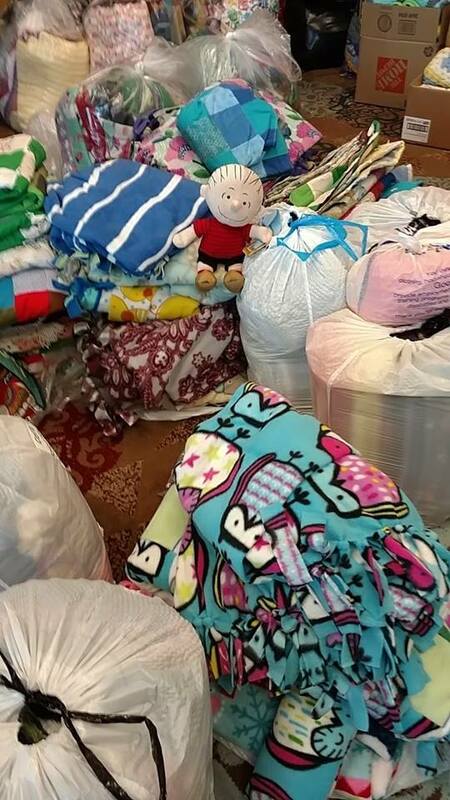 Saturday night allowed us to introduce the 55 Florida Pages to everyone in attendance, present our OTAH and Outstanding Volunteer Genealogist Awards, and announce the final total of 1719 handmade blankets collected for Project Linus Snowball Express. President General Dillon gave her keynote speech and the Florida Daughters were rejuvenated with her understanding of where we are and how we are moving forward. She was presented with a donation to her project as well as a sterling silver sun for her charm collection. After our Memorial Service on Sunday morning, we installed the officers for the 2019-2021 Yarbrough Administration. Florida Daughters are looking forward Continental Congress and to their Fall Forum in September!